There’s a shift going on in businesses across the globe. As digitization disrupts practically every industry, organizations are battling it out on an increasingly digital playing field, meaning digital-first strategies and digital transformation initiatives are becoming the key competitive differentiators. But, not only is digital business transforming existing business models, it is also fundamentally shifting the role of the chief information officer – or CIO – and changing how CIOs can influence the future direction of their organizations. In the past, CIOs were required by organizations to be trusted operators of back-end technologies to support business needs. They were tasked with “keeping the lights on and the trains running.” They kept machines functioning and systems safe and operational. They stayed in the back office, and were rarely required to show their face in the boardroom. Now, however, chief information officers are expected to do much more. Today, the role is conceptualized as a strategic business leadership position, and chief information officers are tasked with driving change and transformation, as opposed to solely taking charge of IT operations. Over the past three years, Deloitte has been conducting a series of annual Global CIO Surveys which have documented the evolution of the chief information officer role and tracked the key changes in business perspectives. In 2015’s survey, three distinct pattern types representing how chief information officers deliver value to their organizations were put forward. These manifest as the Trusted Operator, the Change Instigator, and the Business Co-Creator. Three years ago, Deloitte concluded that no one pattern type was superior to any other –each was a manifestation of an organization’s specific needs and mandates. 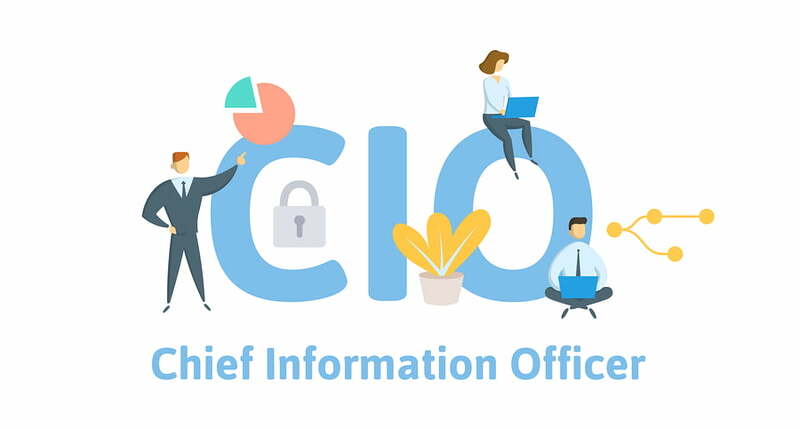 In the 2016-17 survey, however, things were starting to change, and it was concluded that chief information officers’ roles were likely to shift among the three pattern types over time in line with the changing needs of the organization. 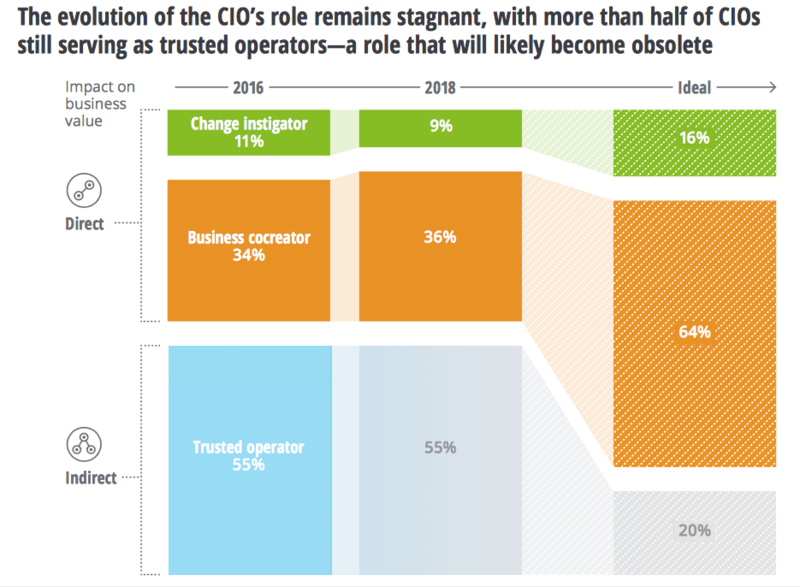 This year, the survey results indicate that although 55% of chief information officers are currently serving as Trusted Operators, this pattern will gradually become obsolete as the digital era progresses. As such, Deloitte concludes that to remain relevant, influential, and help their organizations use technology to progress business strategy, CIOs should develop themselves as Change Instigators and Business Co-Creators. Far more than simply keeping the lights on and the trains running, the top two expectations of today’s chief information officers are to align to business strategy and transform business processes, with IT operational excellence as the third highest expectation. 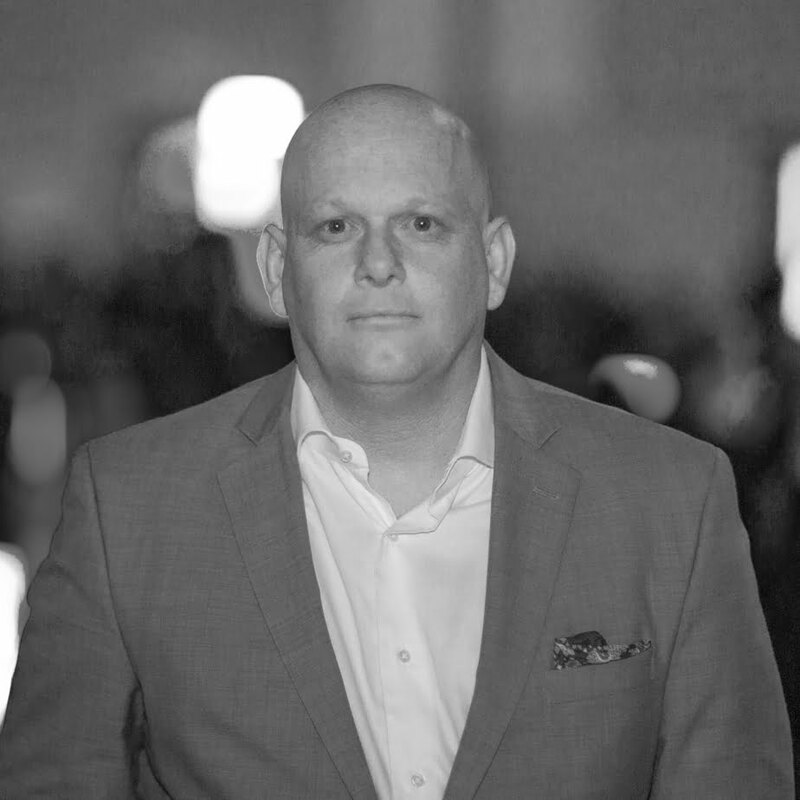 Chief information officers are of course still entrusted to build and maintain solid back-end core systems for their organizations, but they also need to be driving new value-generating business models, engaging employees and customers, and leveraging digital technologies to streamline business processes. The fact is that today, business strategy and technology are inseparable, and chief information officers need to be realigning their roles to the new business reality of the digital era. In short, today’s chief information officers need to be more than functional leaders, but take active roles in shaping and leading the digital future of their organizations. In addition, CIOs need to be well-rounded and knowledgeable in all aspects of business, which includes the human side of management and relationship development. So – what does this really mean for chief information officers over the next five to ten years? Indeed, what are the most important qualities and skills today’s CIOs need to drive their organizations forward? Let’s explore some of the key insights from the 2018 Deloitte Global CIO Survey for answers. 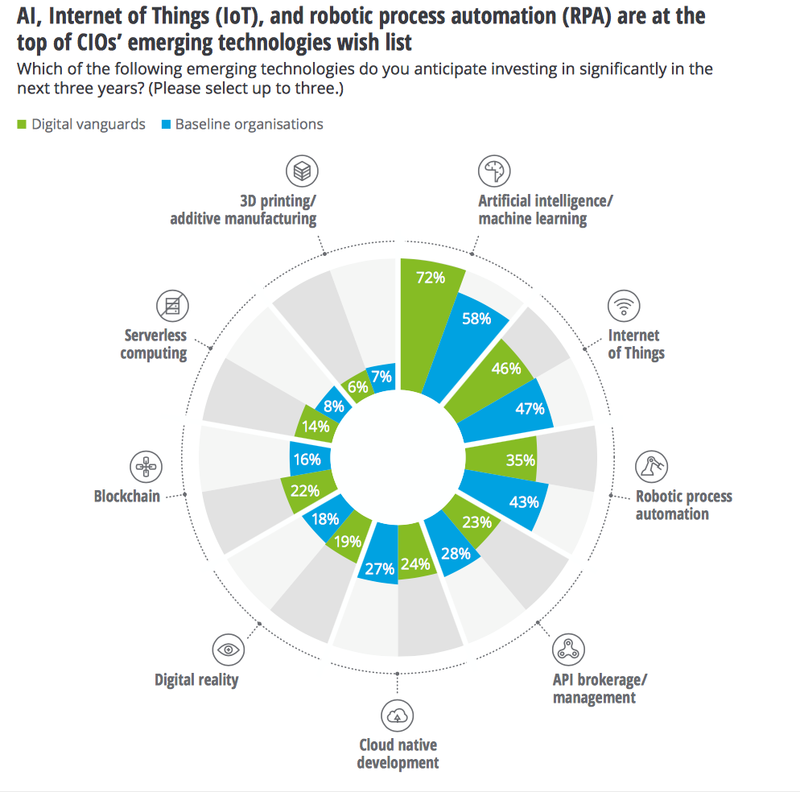 Over the coming decade, organizations will be increasingly looking to harness emerging technologies – such as blockchain, virtual and augmented reality, automation, machine learning and artificial intelligence – to drive business transformation and growth. In response to these demands and pending changes, chief information officers need to be becoming trusted digital champions in selecting the technologies that will both transform business operations and drive top-line growth through improved customer experiences. In this way, they need to become true partners in shaping the digital future of the business. In fact, according to Deloitte’s survey, nearly 70% of respondents agree that the CIO – even more than the CEO (61%) – will have one of the most important roles in driving digital initiatives over the next three years. Unlike traditional chief information officers, the innovative CIOs of the future must be willing to invest time and energy exploring and becoming early adopters of emerging technologies to maintain operational excellence and meet or exceed customer expectations. They mustn’t rest on their laurels, nor view things like cloud computing, Internet of Things (IoT), or big data technologies as fads, but instead experiment and stay ahead of the technology adoption curve. In short, CIOs need to move away from being stewards of technology and become technology leaders and drivers of digital strategy. In order to become organization leaders, chief information officers must build strong, interdepartmental relationships. Working across practically every part of the business is one of the great things about IT, but CIOs need to know what drives each department and how to build solid connections across the organization. Today’s CIOs report strong relationships with certain peers – particularly back-office leaders – but their relationships with executives in customer-facing functions such as sales, marketing, and product development/engineering are weaker, according to the survey’s findings. 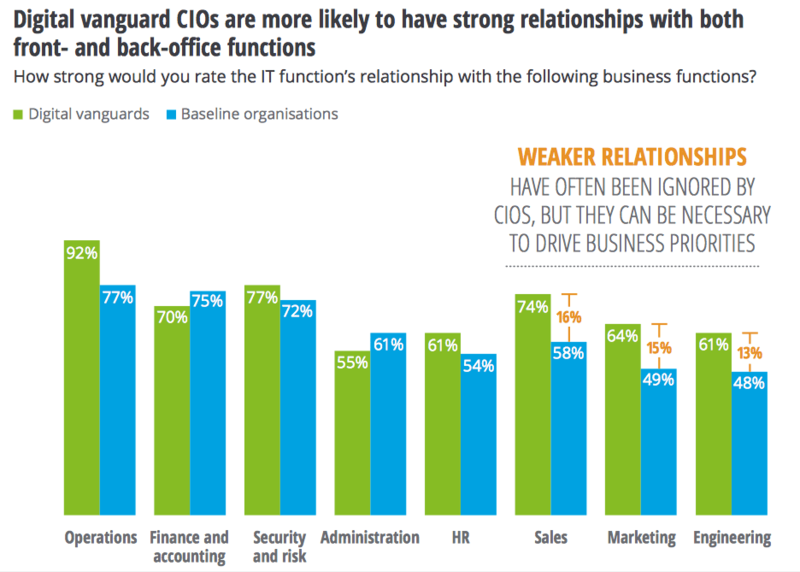 The gap between chief information officers in digital vanguards (i.e. organizations that have an advanced digital vision and strategy and whose IT is perceived as a market leader in terms of digital and emerging technologies) and those in baseline organizations is most apparent with regards to relationships with customer-facing functions. 65% of digital vanguard CIOs report strong or very strong relationships here, compared to only 50% of those in baseline organizations. In order to evolve from a position of Trusted Operator to Change Instigator and/or Business Co-Creator, CIOs need to deepen their relationships with customer-facing business units, from where they can initiate digital strategies to grow customer loyalty and revenue. One clear way that chief information officers can work to foster better relationships with their peers is through promoting tech fluency (i.e. the ability to broadly understand and confidently discuss IT concepts) across the organization. By doing so, CIOs can help create a shared baseline of knowledge that engages both leaders and employees and help optimize technology’s impact. For example, an effective tech fluency program will enable business leaders to understand the fundamental concepts and benefits of emerging technology and technology solutions, and thereby render them more likely to approve, fund and participate in those initiatives. In addition, tech fluency programs can also help developers, strategists, sales executives and marketers to collaborate more effectively on products and customer tools. 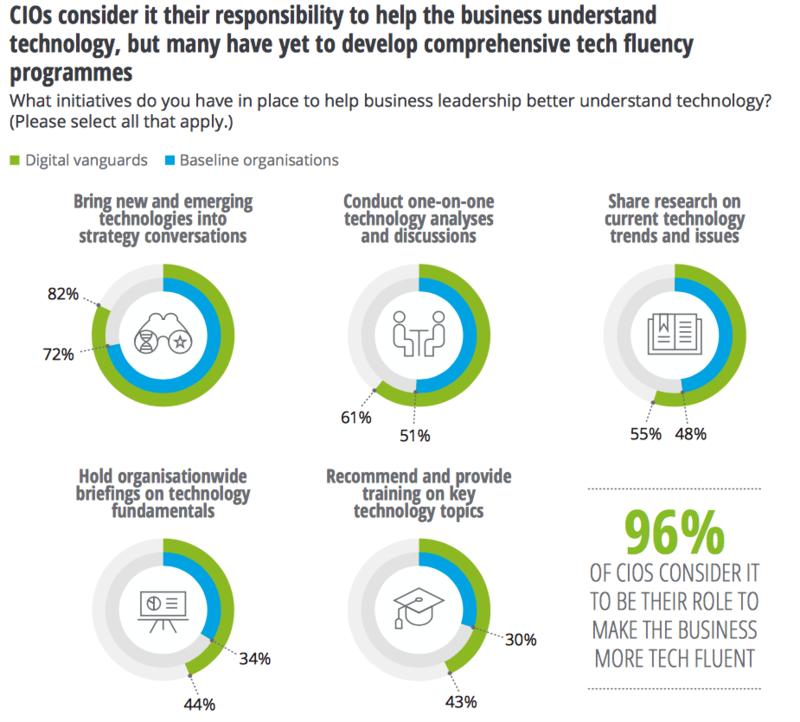 Already, 96% of CIOs consider it their role to educate the business about technology issues, yet only 66% have developed proactive educational initiatives that reach beyond the executive level to help build tech fluency throughout the entire organization. Very few chief information officers at baseline organizations (30%) recommend and provide training on key technology topics, relying instead on ad hoc tech fluency exchanges such as bringing new and emerging technologies into strategy conversations (72%), and conducting one-on-one technology discussions (51%). To fulfill their top expectations – that is, to align to business strategy, grow revenue, and transform business processes – CIOs should be developing structured tech fluency initiatives for both back-office functions and customer-facing teams. In addition, chief information officers and IT teams should be collaborating more closely with the business so they themselves become more fluent in understanding and addressing customer needs and expectations. 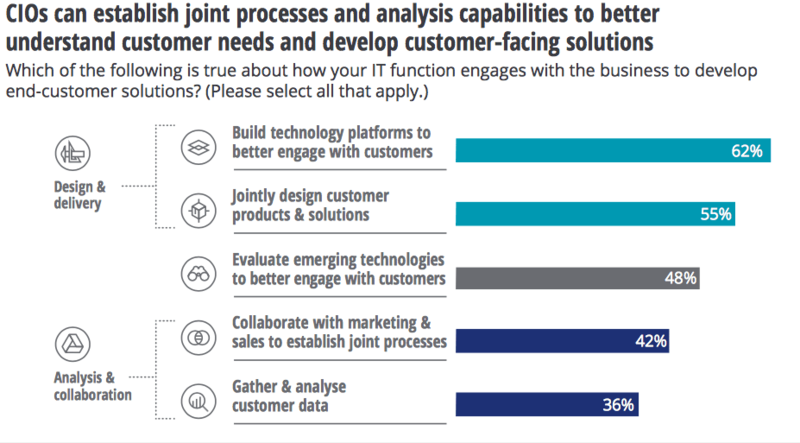 According to the Deloitte survey, 62% of IT teams already collaborate with the business to design and deliver customer engagement platforms, and 55% to design customer products or solutions. But fewer are involved in more proactive measures, such as introducing new technologies to improve customer engagement (48%), establishing joint processes with marketing and sales (42%), or analyzing data for customer insights (36%). By focusing on these areas and deepening their interactions with customer-facing departments, CIOs can build a stronger understanding of customer needs, improve their relationships across the business, and ultimately take a key leadership role in helping the business develop better customer solutions. Chief information officers face the challenge of convincing their peers that emerging or behind-the-scenes technology investments are worthwhile. Ideally, they need dedicated finance talent that can help model and manage IT investments and justify them to the C-suite and the board – but only one fifth of CIOs have access to such talent. Nonetheless, CIOs must be able to connect technology investments to business outcomes if they are to attain the funding they need to push their initiatives forward. This becomes an easier task when IT and the business are aligned on investments and prioritization, though unfortunately such alignment is far from common. Only 52% of baseline organizations have a technology investment decision-making process jointly owned by IT and the business, and only 35% have a clear process for prioritizing IT investments. Digital vanguards show slightly more structure, with 60% sharing the investment process with the business, and 51% having a clear process for prioritizing IT investments. What’s more, 37% of chief information officers (36% at baseline organizations and 40% at digital vanguards) believe they have a well-defined IT investment process and business case template – yet 75% of other C-suite executives disagree, indicating a fundamental disconnect in budget discussions. There is also a lack of consistency in how the impact of IT investments are measured. About two-thirds evaluate IT investments on a case-by-case basis, roughly one quarter rely on business leaders to measure outcomes, and only 27% use a consistent financial model – a leading practice that can improve accuracy, objectivity and alignment with business strategy. 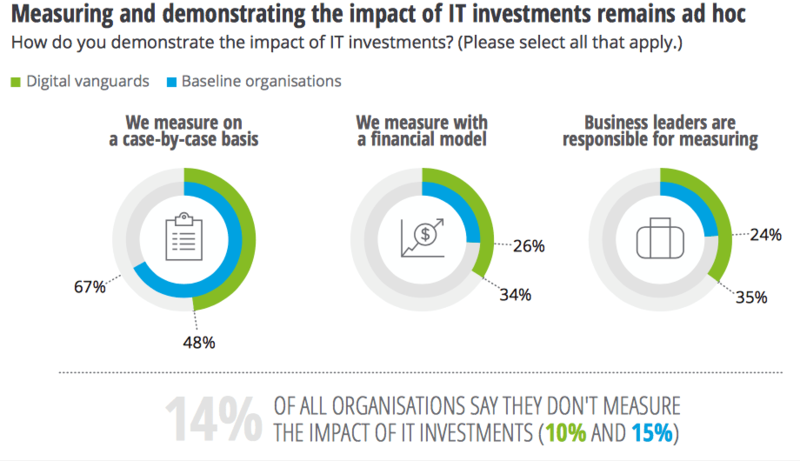 Somewhat alarmingly, 14% of chief information officers don’t measure the business impact of IT investments at all. As cheaper storage and processing costs, cloud platforms and outsourcing continue to drive down operating costs, the challenge presented to chief information officers is to take advantage of those savings and convince business leaders to put them towards business innovation. 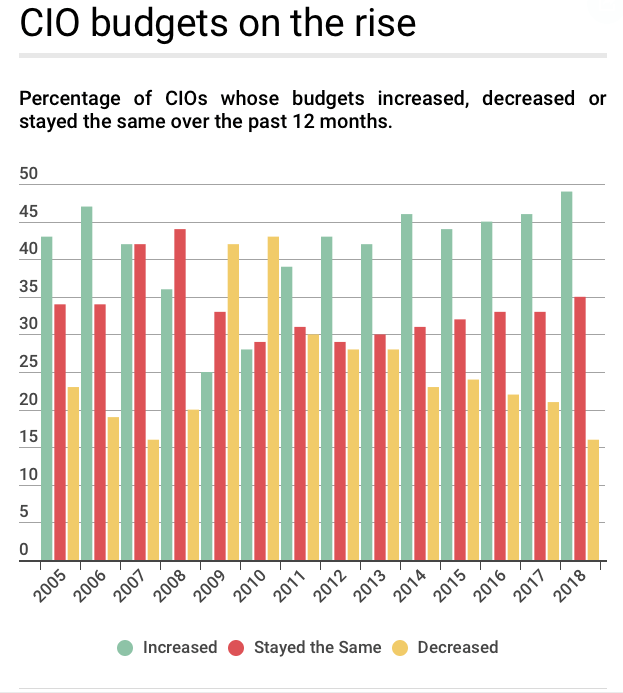 The good news is that CIO budgets are on the rise, according to Raconteur. However, now chief information officers must acquire the skills to tell convincing value creation stories so that consistent prioritization, measurement and accountability are established to ensure there is no underinvestment in new and emerging technologies going forward. As IT’s mission moves from “build and run” to “imagine, explore, architect, and design”, CIOs need to be looking for a new combination of skills, and to be creating an internal culture that both attracts new talent and locks it in for the long term. While technical expertise – particularly in new and emerging technologies – remains critical, intellectual and interpersonal strengths, flexibility, and drive to adapt and excel in environments of shifting business demands are becoming increasingly important. As they make hiring decisions, chief information officers are now looking for three soft skills – creativity, cognitive flexibility, and emotional intelligence above all others. Traditionally, service orientation is a skill that has been highly valued in IT, but CIOs believe that it will decrease in importance over the next three years. Today, 65% of CIOs hire for this skill, but only 52% expect to be looking for it in the future. Other traditional skills – including complex-problem solving, leadership, and critical thinking – will continue to be valued. Finding and hiring talent with the appropriate blend of technical and soft skills is a top challenge for CIOs today, with 60% reporting difficulty in this area. To combat the issue, chief information officers need to be building an appealing organization culture to attract and retain top talent – and particularly millennial talent. 81% of digital vanguards and 61% of baseline organizations credit opportunities to work with emerging technologies as the leading attribute that helps them do this, with 55% and 43% respectively also citing the creation of a fun, creative and inspiring environment. Flexible working arrangements and telecommuting are also important. According to the 2018 Deloitte Global Millennial Survey, salary and a positive working culture are the two most important factors in attracting millennial talent. As such, CIOs looking to build a winning team for the future need to be cultivating a culture that chimes with the needs of the up-and-coming generation. In addition, they need to be on the lookout for a wider range of skillsets – not just technical superstars, but workers with great soft skills and the potential to be more than diligent order-takers (i.e. Trusted Operators), but effective collaborators and business problem-solvers (Business Co-Creators and Change Instigators). This is a critical moment in time for CIOs. As the role evolves, the chief information officers of tomorrow need to be prepared to step out of the shadows and join the ranks of executives strategizing and executing the business’s next moves. They need to be digital champions, pursuing innovation and exploring emerging technologies at every turn. They need to be building relationships across departments, and promoting tech fluency throughout the organization. They need to be telling value creation stories and vying for investment, and carefully building winning teams for the future, hiring wisely for the right mix of technical and soft skills. Do all this, and CIOs will find that business leaders – both back-of-office and customer-facing – and board members will start coming to them for advice on how to solve business challenges, and they will establish for themselves a firm place as an organization leader.